Kenneth Allen Hardin, was born on September 20, 1940. He was born and raised in Morehead, Kentucky. He has one sister, Lillian. Some time after joining the army when he was 18, he was transfered to Texas to work at the Red River Army Depot located in Hooks, TX. My mother was living in Simms, TX when they met. Both Hooks and Simms, TX are very small towns in northeast Texas, not far from Texarkana, TX. They were married in Novemeber, 1961 when my mother was 18 and my father was 21 years old. I, Rachel, was born on September 13, 1962. My brother, Dale, was born on March 15, 1964. We are the only two children. 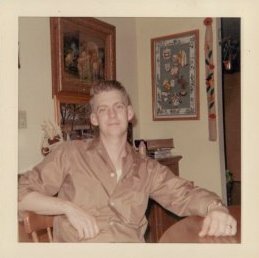 My dad was sent to Vietnam in January, 1968 and was killed April 9, 1968. April 9th was also his father's birthday. We lived in Germany briefly before my dad was sent to Vietnam. My father was 27 years old at the time of his death. I was 5 1/2 years old, my brother had just turned 4, and my mother had just turned 25 when he was killed. I can remember a man dressed in Army attire coming to the house to give my mother the terrible news about my dad. I remember how much it scared me to see her crying so hard. My dad is buried in Clearfield Cemetary in Morehead, Kentucky. He is missed very much.